It won't all be the delights of business! There will be time to socialise in beautiful Prague! Professional guide will take us on pleasant sightseeing tour of Prague with a pleasure walk through Prague Castle, the Lesser Town, Charles Bridge and other Prague's monuments. We will start the walking tour of Prague with the area of the famous Prague Castle. Prague Castle is the largest medieval castle complex in Europe. Destructive wars and fires, along with differing political forces have combined to create a truly unique architectural complex. The Prague Castle complex, seat of Czech kings throughout the ages, includes the Gothic St. Vitus Cathedral (the most conspicuous landmark in Prague), several palaces, a monastery, viewing towers, St. George's Basilica and the enchanting Golden Lane. Today, Prague Castle is the seat of the President of the Czech Republic, and serves as the historical and political centre of both city and state. We will continue with walking through the Lesser Town, which was founded in 1257 on the slopes bellow the Prague castle and it is the part of Prague least affected by resent history. Via the well-known Charles Bridge we will reach Prague Old Town. Firstly mentioned in 1091- it is the oldest of the towns of Prague gained the privileges of a town in the 13th century. 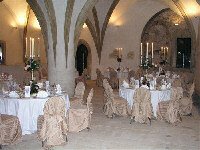 However, its name dates back to the 14th century when the New Town was founded. The centre of the Old Town has always been the Old Town Square dominated by the Church of Our Lady of Tyn and the Town Hall. The most popular part of the tower of the Town Hall is the Town Hall Clock (Orloj). Originally installed in 1410, the clock was rebuilt by the Master Hanus in 1490. It consists of three parts - the procession of Apostles, the astronomical clock and the calendar. Our last stop will be Wenceslas Square - the part of New Town. The carefully planned New Town was founded by Charles IV in 1348. Twice as large as the Old Town, it was mainly inhabited by tradesmen and craftsmen. During the late 19th century its outer fortification were demolished and redeveloped to its present appearance. has assumed patronage of ISBIS-2008. Welcoming by a representative of Prague Municipality and representative of Minitab Ltd. The New Town Hall (Czech: Novoměstská radnice) is the administrative centre of Prague's (medieval) New Town Quarter, or "Nové Město". First mention of the New Town Hall in Charles Square dates back to 1377, but not much was left of the building from that time. Several parts were added at the beginning of the 15th century, the most noticeable one being the high tower with a big bell and a chapel inside. The New Town Hall served its original purpose as a seat of the municipal administration until 1784, when the Emperor Josef II. decided to unite the four Prague towns - Old Town, the Lesser Town, Hradcany and the New Town - into a single town with one town council. After that the New Town Hall was turned into a criminal courthouse and a prison with a torture chamber. Many people, especially revolutionaries, were kept here. The appearance of the building changed rapidly in the 16th century. The south wing was rebuilt in Renaissance style and decorated with high gables. Notice a piece of chain fixed to the building. It dates from the time when Prague streets were closed by chains. 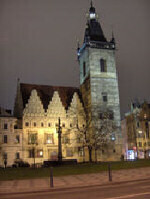 The New Town Hall became very famous because of the event that happened in the 15th century. On 30th July 1419 a crowd of demonstrators led by Jan Zelivsky demanded that several of Jan Hus's followers be released from the prison. When the councillors refused to release the prisoners, the outraged crowd burst into the building and threw the councillors out of the windows. The councillors who survived the fall were beaten to death. This event was called the First Prague Defenestration and started the Hussite movement asking for reforms in the Catholic Church. In the interior of the "Mazhaus" building, numerous gothic portals, vaults, wall paintings from the 15th century and slab painted ceilings from the 16th century were restored. The New Town Hall is now a national cultural heritage.